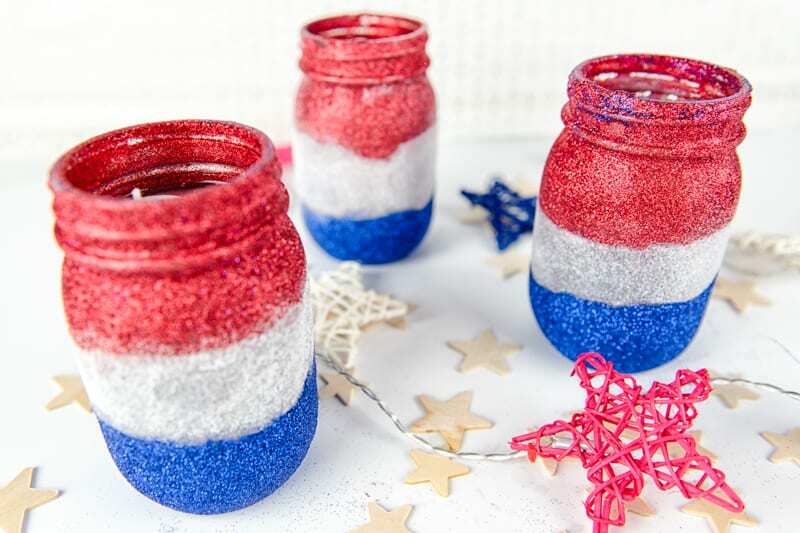 These Glitter Patriotic Mason Jars are not only adorable as decor but they also double as a bug repellant holder…perfect for your summer bbq’s! Glitter. It’s one of those crafting tools I don’t pull out unless it’s absolutely necessary. I just don’t care for the mess. That stuff gets everywhere and I end up finding glitter months after I first used it. But….I like pretty and shiny things so the glitter comes out eventually. Plus, if you do it right glitter crafts don’t take that long! And y’all know how much I’m into those quick and easy crafts. A friend and I were talking a few weeks ago about essential oils and the benefits of using them. I’m not one of those people who is very into them, but I do see their value every now and then. And with summer finally here and us actually being able to go outside this year and not stuck in a hospital (YAY!) I have to think about bug spray and how to protect my family. Chris always gets eaten alive no matter where we are, even when he uses bug spray. But we don’t know where our kids falls; in my camp or Chris’s. So I want to make sure that I’m protecting him and us without spraying a ton of chemicals. So a quick Pinterest search led me to a natural recipe for bug repellant…and I definitely want to try it out this year! With bbq’s, play dates, and evenings spent out on the deck I knew I needed something to put the natural bug repellant in. My first thought was mason jars because HELLO I’m from the south, and they’re practically a staple in everyone’s home down here. But I wanted to dress them up a bit and make them different. And when I opened up a desk drawer and found a whole pack of glitter staring back at me I knew that’s what I wanted to use. At first I was only going to glitter the bottom half of the mason jars. Super simple, super quick, and so cute! They sat on my kitchen counter drying for about 24 hours and I couldn’t help but feel underwhelmed every time I saw them. I mean, they were cute but it just wasn’t enough. They were missing something and I couldn’t figure out what. After sleeping on it I realized that they just looked weird. I needed to fully cover them in glitter or not at all. So I scraped off all the glitter (which was surprisingly easy) and started over. And you know what? I like them even more now. 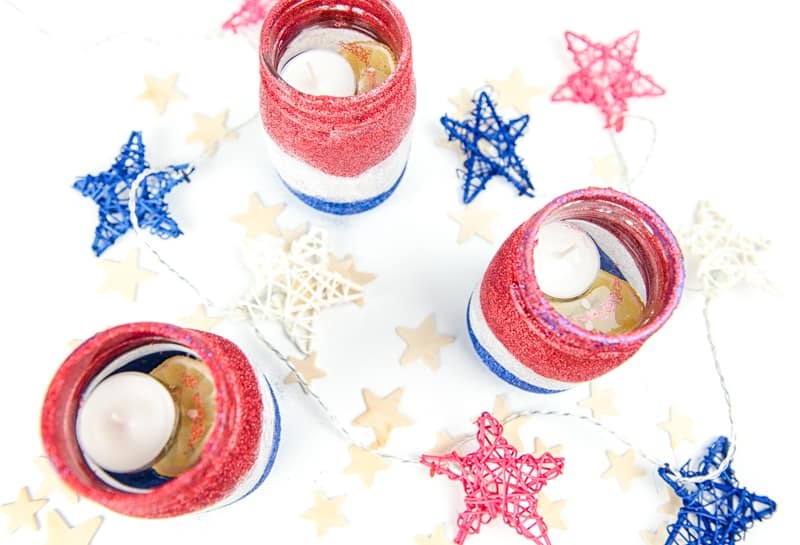 Check out how easy it is to make your own Glitter Patriotic Mason Jars! + Cover your mason jar in mod podge. I did one third of the jar at a time because I was doing three different colors. It makes it easier to handle the jar and not mess up the glitter that way! PRO TIP: Put on a very thin coat and make sure there are no drips! If there are drips it’ll make the glitter clump and you want the glitter to go on smoothly. + I wanted 3 stripes of glitter on my mason jar. So I put the red on first and covered the top portion, then white, then blue. I didn’t care to have clean lines where the colors met, so just go slowly and make sure you cover each section fully in glitter. After you’ve gotten glitter on each section, gently tap the sides of the mason jar to remove the extra glitter. PRO TIP: Let each color dry before you put the next one on. If you don’t, you’ll smudge/remove glitter where your fingers touch the jar. + Set the jars upside down and let them dry (for me this took about 10 minutes). You can put another layer of mod podge and glitter on which I opted to do. But it really depends on the look you want to go for. + I let my jars sit overnight before putting the final layer of mod podge on to keep the glitter in place. 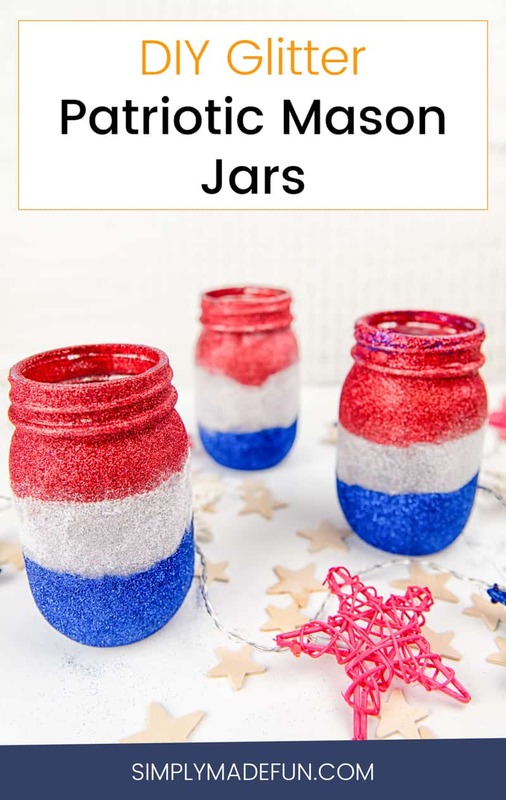 Depending on how many colors you use and how thick you put the layer of mod podge on will depend on how quickly the glitter patriotic mason jars dry. Because I used three colors and applied glitter to the entire jar this project took about half an hour to do. That doesn’t account for amount of time I let them sit overnight to finish drying. But really, I don’t think that counts anyway. I mean, don’t we all let our projects sit out overnight before we use them the next day?! For the natural bug repellant I used this recipe I found on Pinterest. Chris said it smells really good and when we were outside the other night hanging out he didn’t get bit at all! So he’s definitely a fan. I think the next time I attempt something like this I’ll do two things differently: (1) I’ll apply the glitter outside because right now I have it ALL OVER MY CARPET 😩, and (2) I’ll either paint the jars next time I want to do multiple colors OR only use one color glitter. You craft and you learn though, right? At least now I’m prepared for summer and the mosquitos with these cute glitter patriotic mason jars! Even if they were a mess to make. What is your favorite thing to have on the food table at a summer bbq?